An exceptionally entertaining story about ex-Rep. Roscoe Bartlett (R-MD), who used to represent western Maryland before being gerrymandered out, and his efforts to go off the grid. "The oddest Congressman" indeed. Hussein Ibish to people who try to leverage the story of Jesus to favor Israeli Jews or Arab Palestinians: Stop it. You're being stupid and you don't understand how history works. Just stop it. Omar Khadr, convicted of throwing a grenade at American soldiers during a battle in Afghanistan, now is trying to get a normal education. A fascinating blog about a recent law grad who (after being no-offered by his sumemr firm) is now selling perfume at a department store. Sometimes, when I reflect on my job, I think "that could be me" (mostly with relief, but admittedly occasionally with wistfulness). 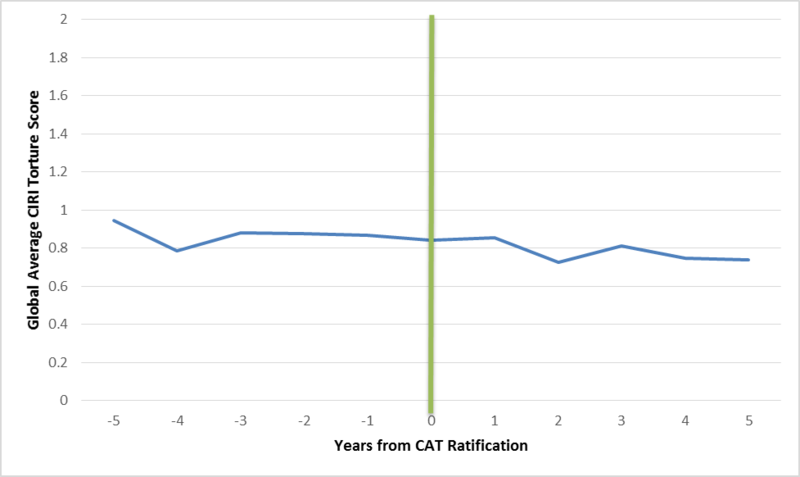 The x-axis shows the five years before and after a country ratified the CAT. 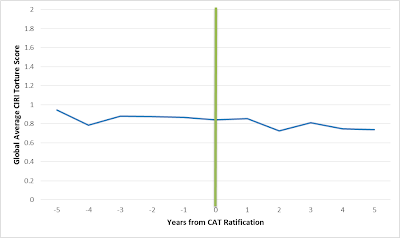 Year 0 is the year that the country ratified the CAT. For example, year 0 for the United States was 1994, while year 0 for Nicaragua was 2005. The line shows the average torture score for countries during the five years leading up to ratification and the five years following ratification (where 0 refers to frequent torture and 2 refers to no torture). If the average country had reduced torture during this period, then the line would have sloped up. You'll notice the line does not really slope at all. Anyone can sign a piece of paper, people. Eugene Volokh comments on assault weapons bans which reference "pistol grips". The rationale for targeting such grips is that they make it easier to spray-fire while shooting from the hip. Volokh observes that spray-firing from the hip is far less accurate than aiming down one's sights, and therefore a criminal who fires in such a manner is less dangerous than one who does not. In terms of what Volokh is "missing", I think it is that he is envisioning a different type of criminal than the enactors of the bill are. Volokh imagines a criminal who is specifically aiming to kill a particular person, in which case it is better for said criminal to be less accurate. When I think of spray-firing, though, I think of a criminal whose primary goal is to instill terror (as in a drive-by shooting, though I don't know how one fires a gun from a moving car). The primary objective is not to hit a particular target, and moreover to the extent there might be a specific target the shooter also probably doesn't care too much about collateral damage. As far as I'm concerned, I'm less frightened of a criminal trying to assassinate me specifically than I am about being in the wrong place at the wrong time when some thug is trying to "send a message" or whatever. I think there are fewer criminals interested in shooting me particularly than there are criminals who don't care who gets shot at all. Or to borrow from an old war saying: "Don't worry about the bullet with your name on it. Worry about the piece of shrapnel marked 'occupant.'" In short, we target this grip because it seems most appealing to a particular type of criminal who is particularly unconcerned with human life. As Volokh notes, this may mean we are proportionately less concerned about criminals who are quite concerned about human life and are making a deliberate and conscious choice to end it. And this may even mean that we're not optimizing the number of murders we could be deterring, though this is less certain. Two men commit an armed robbery on the same night. The first man is a father of four. His family is about to be evicted. Or if you want to make him less sympathetic, let's say he's a drug addict who needs money to buy his next fix. He's nervous, he's sweaty. He's desperate, and he's panicky. He approaches his victim and roughly accosts him. He puts his gun to the victim's head. He's screaming profanities. He screams out for his victim's wallet, then screams louder and threatens the victim for moving too slowly. He takes his money and runs off. His victim is terribly frightened. In the second scenario, our mugger is calm, cool, and methodical. He approaches his victim from the front, puts a light hand on the victim's back, and slowly and unemotionally explains that he has a gun in his coat pocket. He tells his victim that if he hands over his wallet, no one will get hurt, and they can both be on their way. The victim hands it over. The mugger walks off. The victim is angry at just having been robbed, but he isn't terrified. And he was never in real fear for his life. Which of the two armed robbers is likely to get the longer sentence? Almost certainly the first one. Which of the two is the bigger threat to society? Unquestionably the second one. In fact, the second one is not only a likely career criminal, he's more likely to actually kill someone. The first one is scared because he knows he's doing something wrong. He feels some empathy for his victim. He's committing a crime of necessity. That isn't to say it excuses him. But his aggression comes from fear. The second mugger is incapable of empathy, or has learned to turn it off. He's cold-blooded. So you see we impose punishment based on fear and a desire for retribution, not based on rational evaluations of what crimes and criminals are most dangerous. This, I think, is a major motivator here. With the second mugger, or the "aim down the sights" criminal, we know the script. We know what we have to do to walk away (physically) unharmed. The first mugger, or the spray-from-the-hip gangbanger, doesn't allow us that luxury. It is scarier precisely because it is completely out of our control. Does Dalton raise a good point that we should care more about harm than about what is scary? Sure. But it is not entirely unreasonable to target certain types of criminal activity -- and the devices that enable them -- because they make us feel more unsafe. After all, a large part of crime control isn't about actually playing the efficiency game and figuring out when the costs of crime control are justified based on tangible losses. A large part of it is based on creating the feeling of security and safety; so that stepping onto the street isn't itself a source of anxiety and panic. That's worthwhile in of itself. And where we can help create that feeling of safety at the minor cost of prohibiting a grip which, as Volokh's post observes, is apparently not particularly useful for legitimate social purposes -- that trade doesn't seem unwarranted. A list of all the privileges of being Black. Don't forget flying first class on Southwest!